Hoes are used to till soil for harvest. To till, shift-click a dirt or grass block within a three block radius of water. The block will turn into farmland, which will be ready for planting seeds. 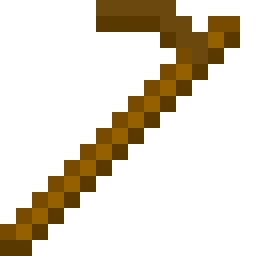 Hoes can be made using two sticks and two wooden planks, cobblestone, iron ingots, gold ingots or diamonds. Each makes their respective type. In order from worst to best, these are the tiers: Gold, Wooden, Stone, Iron, then Diamond. This page was last edited on 11 June 2018, at 12:01.